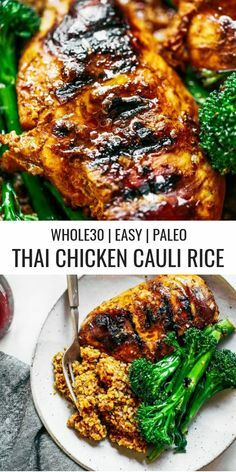 Easy thai chicken cauliflower rice. A delicious, whole30, and paleo family meal! You can even make this dish ahead of time, freeze it, and eat later! Easy whole30 meal prep. Puree ingredients for sauce in a blender until smooth. Marinate chicken breast in 1/3 the sauce and put in the fridge for 30 minutes. Cook chicken on either a grill pan or skillet (I did both!). Place chicken on a well greased pan, cover with a lid, and cook for 5-6 minutes on each side until cooked through (there should be no pink on inside when cut open). Once the chicken is cooked, remove, and add broccoli to cast iron skillet and cook in leftover juices until it's soft, but not mushy. In the cast iron skillet, pour the rest of the sauce over the cauliflower rice and cook for about 10 minutes until soft (stirring on occasion to prevent sticking to the pan). Then serve with chicken and broccoli.